Thanks to my library’s wonderful support for professional development, once again I got to attend the Massachusetts Library Association (MLA) annual conference. This year’s theme was “through the library lens,” though none of the sessions I went to specifically addressed what that might mean. (Could it just be a joke about how most of us wear glasses?) (Probably not.) 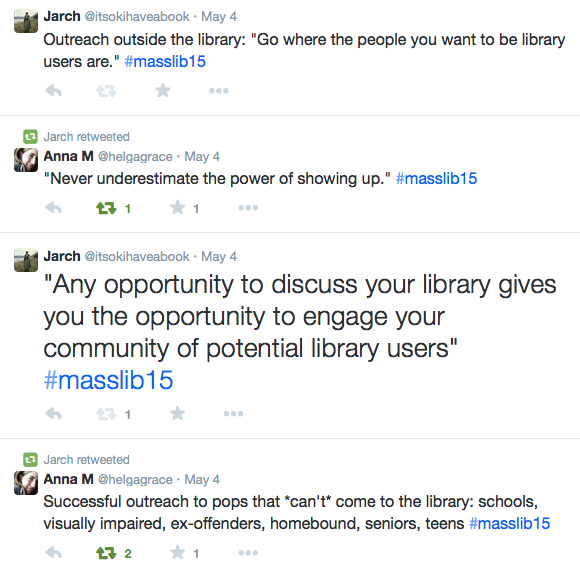 The conference hashtag was #masslib15 and several of us were active on Twitter during the conference. This session started off with a seven-minute video (“Did You Know 2014“); it’s worthwhile, but I recommend watching it without the sound. The main point is that the world is changing rapidly, especially technology. Libraries can encourage their staff to be “lifetime learners” and create a learner-centric culture by implementing a “bite-size learning” program: each participating staff member gets to spend an hour a week learning something new. This learning is self-directed, internally motivated, goal-oriented, and self-paced; it is relevant to the individual, and is experiential (learn by doing). Individuals might choose to familiarize themselves with Overdrive or read storytime blogs; they might explore Ancestry.com or take a webinar on any number of subjects. Managers/leaders can start with competency checklists and tailor them to their departments. Staff set specific goals and check in with their supervisor each week to track progress; supervisors participate in the program too. Seeing department heads and directors learn new things sets a good example and breaks down the fear of failure that can accompany trying something out of one’s comfort zone. A paralibrarian from Reading spoke movingly about how the bite-size learning helped her; she said, “Technology isn’t my thing, but learning is….I don’t want to become a senior citizen who didn’t keep up with technology. I want to communicate with the younger generation on their terms….We have to know how to do these things.” Learning new skills builds confidence in one’s ability to learn, and in one’s ability to help others – a pretty big payoff in exchange for an hour a week. “Stealth reference” is a very cool name for what is usually referred to as “outreach.” Margot from Baystate talked about identifying your vulnerable populations, and aligning programs with community needs. She teaches the public directly, taking questions and answering them by mail (five stars for follow-up! ), and she also teaches the people who teach the public, like The Literacy Project. Anne from Chicopee asked herself, “Who am I seeking? What am I offering?” and asked what motivation potential users had to come to the library. Anne, I suspect, doesn’t sleep much: she has gone into schools, visited homebound patrons, worked with teens, connected to the visually impaired community, gone to the farmers’ market, worked with the sheriff and ex-offenders, and worked with the Council on Aging (COA); there is a bookmobile in her future. Anne suggested collaboration: with town departments like Parks & Rec, the COA, planning boards, and local events. She noticed that program popularity is cyclical; what works one year may not work the next year. “We’re always awesome and helpful,” she said, “but people don’t always know that.” If every library had a Community Services Librarian like Anne, more people would know about all the things libraries have to offer. Last but not least, John also talked about leaving the library building, going where the people you want to be users are, and showing them what they’re missing. “They don’t know they want things” or they don’t think the library has them. He recommended contacting businesses in the area; even chains like Starbucks and Whole Foods sometimes have community relations people who may be eager to help. Bring some handouts with you, he advised, but those handouts should be immediately useful – a calendar of events, a link to the digital media catalog, etc. One of the challenges libraries face with outreach efforts – assuming that library leadership supports it – is finding the time for staff to leave the building. Many public libraries are short-staffed, and most won’t consider leaving the reference desk unattended while librarians are at the farmers’ market, the high school, or the senior center. Off-desk hours are precious too – that’s when we order books and other materials, plan programs, create booklists and displays and flyers and a hundred other things – but starting small is better than nothing at all. 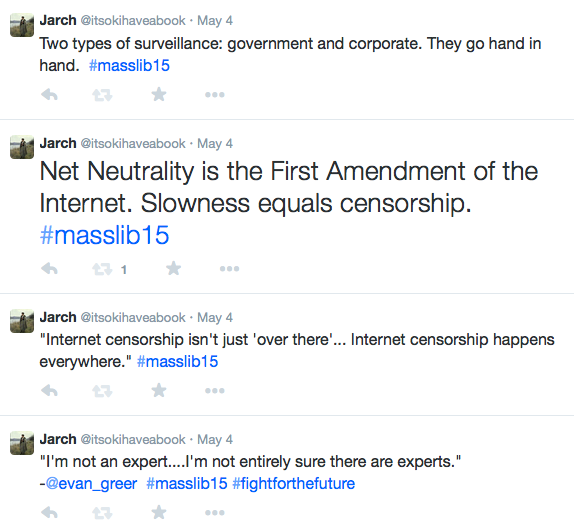 Like many privacy advocates, Evan is an impassioned speaker. She concentrated on four modern threats to freedom of expression on the Internet: (1) attacks on Net Neutrality, (2) mass surveillance, (3) overzealous copyright enforcement, and (4) secretive trade deals, e.g. the Trans-Pacific Partnership (TPP). Her presentation was both entertaining and convincing, though I suspect the people in attendance were convinced before they showed up. 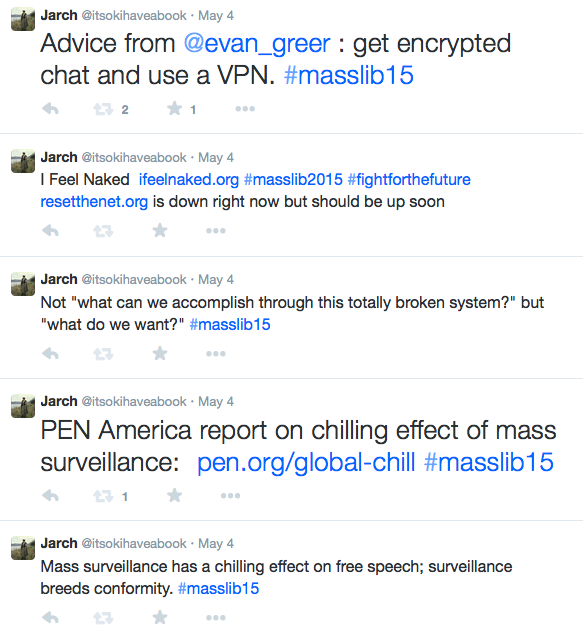 I tweeted throughout this session; see below for tweets and additional links. Rebecca, Kristi, and Nanci all gave general advice about writing reviews as well as specific tips for which publications are looking for reviewers and whether or not they pay (mostly they don’t, but book reviewing shows engagement with the profession and looks good to potential future employers, etc.). They also talked about how they got started; they all “fell into it” (but only if “falling into it” means seeking out and creating opportunities for writing reviews and honing their blogging skills). Rebecca (Shelf Renewal) talked about some of the standard review publications – Library Journal and SLJ, Booklist, Kirkus, VOYA – and their different style guides. Find your voice: is it conversational or formal? Figure out what you want to say and who your audience is. 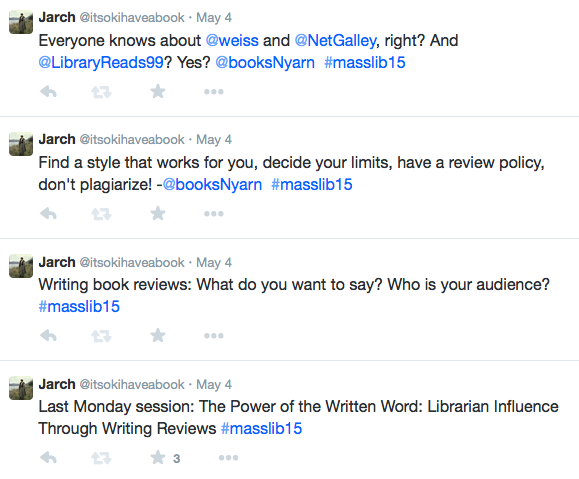 Incorporate readers’ advisory aspects (e.g. appeal factors) into your reviews, and a sense of humor. If you do get your reviews published in one of these sources, cut out your printed review and compare it to what you submitted, line by line; this will improve your reviews. Take cues from existing blogs and websites, and practice writing reviews on Amazon, Goodreads, or LibraryThing. Kristi’s advice: find your review style, decide your limits, have a review policy, and don’t read other reviews of the book you’re reviewing (beware unintentional plagiarism). Identify the hook, the who/what/when/where/why, who the book will appeal to, and of course…no spoilers! Get e-galleys through NetGalley and/or Edelweiss and submit reviews to LibraryReads. Nanci suggested getting involved with your local Readers’ Advisory Round Table (every region of Massachusetts has one), and mentioned a few less obvious candidates for would-be reviewers and writers: NoveList, Public Libraries magazine, Bookmarks magazine, ALA Editions, the Massachusetts Center for the Book, and your local newspaper. Creating readers’ advisory materials for your own library is good practice too: shelf talkers (“If you like ___, try ___”), author and title readalikes, appeal readalikes, “five to try” (genre suggestions), etc. As usual, presenters mentioned so many good resources and opportunities that follow-up will take me the next several weeks. And this was just day one – stay tuned for day two.